A few months ago I met a very nice lady called Alison who travels to Africa and helps African ladies by selling the jewellery they make. The beads they make are beautiful and crafted from recycled paper. 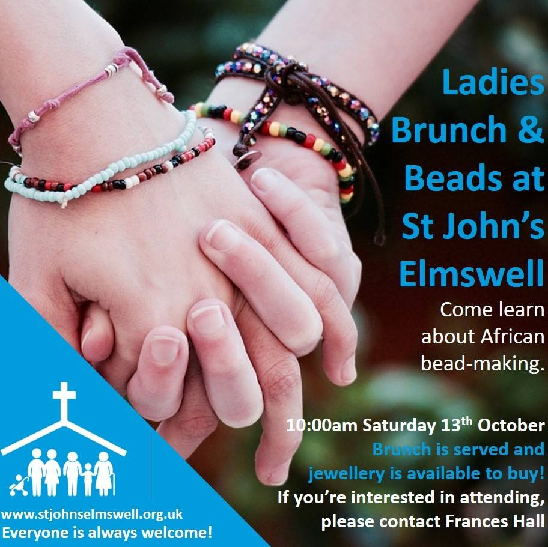 On Saturday 13th October at 10:00am, Alison is going to come to St John's and bring her beads. She will give a talk about the ladies (and their children) and then there will be an opportunity to buy something, if you like. The items are not expensive. I think they start at £2. I'm going to put some brunch - style snacks on - hopefully pastries and a fruit platter and serve some bucksfizz :) I think I will ask for donations to cover the cost .. maybe like £1 per person or so .. depending on how many people come! I'm not planning on bringing my children and hoping to enjoy an hour without them! But if you need/want to bring yours, you'll be very welcome to - let me know and I will get the toys out!